When JP Hale was a teenager, he found himself teaching, over and over again. He worked at his church’s Vacation Bible School, and he volunteered to work with younger students at his school. At 17, he went on a mission trip to Haiti, where he solidified a passion for serving and educating children. More than two decades later, JP Hale is now the director of instructional technology at a rural school district in Texas. He owns Hale EdTech Consulting and hosts EdTech Minute, a podcast that provides practical tips for educators one minute at a time. He’s also a member of the fourth cohort of Pear Deck Certified Coaches. But at the heart of all he does, he’s still dedicated to serving and educating children. JP shares what motivates him to keep innovating for students in this #PearProfile. After 22 years in education, what is your educational philosophy? I believe educators should provide safe, engaging and relevant learning experiences for students to grow and leave space for them to learn from their failures. They should provide nurturing, inclusive, and innovative environments in which students can gain the knowledge and skills they need to be successful. Educators should be instrumental in developing a student’s love of learning and empower them to contribute to society in meaningful ways. What inspires you to keep innovating for the students you serve? In my role, I serve both staff and students. I’m inspired to keep innovating because I believe that through innovation, both staff and students are empowered to learn, lead, collaborate, make and design. In your district, how does technology help your students learn? While our rural community is surrounded by cotton and corn fields, our location does not limit our students’ ability to learn. Technology empowers our students to explore places and learn concepts that might not be possible otherwise. Our students explore virtual worlds and objects on their iPads, operate drones and program robots on their laptops, and design and build solar-powered facilities. Having access to technology as a tool provides students an opportunity to create, collaborate, explore and produce through meaningful experiences. How does Pear Deck positively impact your students’ learning? I believe it’s key that students have a voice and that they grow from feedback. Pear Deck allows all students an opportunity to join in a discussion in a safe learning environment. It also provides great formative assessment through multiple question types that appeal to multiple learning styles for both the student and teachers to use to continue their learning. When you’re not at school, what do you enjoy doing? In my time away from school, I enjoy hikes with my family, woodworking and playing racquetball. You can also find me volunteering for my local church, including a feeding program for underprivileged kids and ministries involving fostering and adopting kids. 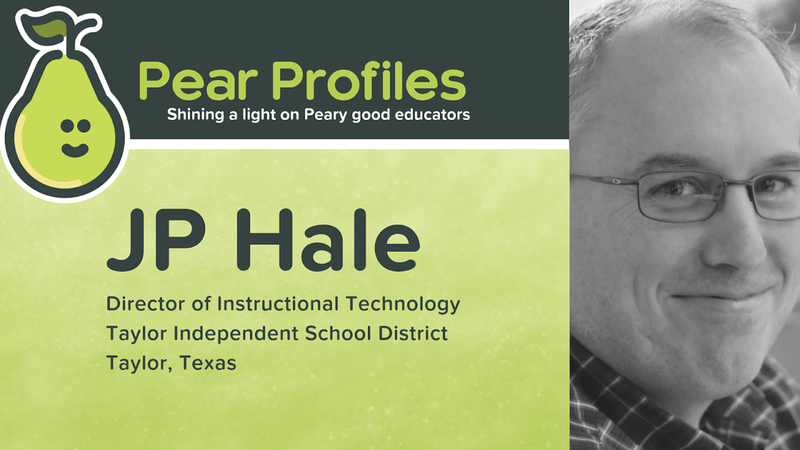 Each month, Pear Deck shines a light on great teachers and educators around the world who use Pear Deck to better serve their students in #PearProfiles. Profiled educators are selected by Pear Deck, who work directly with dozens of educators to develop Pear Deck’s orchard of student-focused products. Learn more in our Product Gallery.